Kathleen M.M. 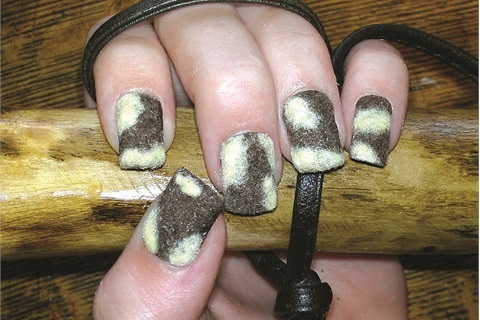 Ringwood-Wood of Poughkeepsie, N.Y., takes regular flocking from her local craft store and puts it right on top of wet polish. Kathleen M.M. Ringwood-Wood of Poughkeepsie, N.Y., is known for her rocking nail art murals and 3-D work, and now she’s added texture to her nail art repertoire. She takes regular flocking from her local craft store and puts it right on top of wet polish. The look dries into a durable nail art design that Ringwood-Wood says should last about two weeks through most everyday activities like hand washing. 1. Polish the nails with brown polish. This will give the flocking a solid color behind it. 2. 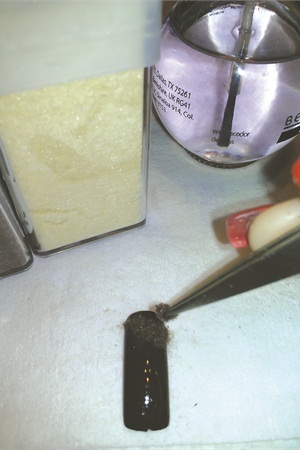 While the polish is still wet, use tweezers to pick up some brown flocking and place it on the polish by dabbing it where you’d like the brown. Pat it down with your finger to flatten it a little. 3. Apply clear polish to the areas where you would like to put cream-colored flocking. 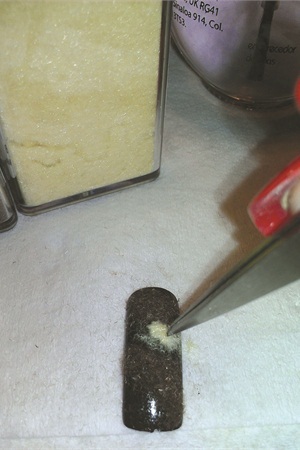 Pick up a small amount of cream flocking with tweezers and place it on the clear polish. Add more to make the color more solid. You can put more clear polish right on the spot you want the cream color — it won’t hurt the flocking that’s already on the nail.